Ford’s big debut at this week’s 2019 New York International Auto Show is the new Mustang EcoBoost High Performance Package – a more potent and performance-focused take on the turbocharged four-cylinder pony car. The Mustang EcoBoost High Performance Package serves as a direct competitor to the four-cylinder Camaro Turbo 1LE and also the Camaro V6 1LE. 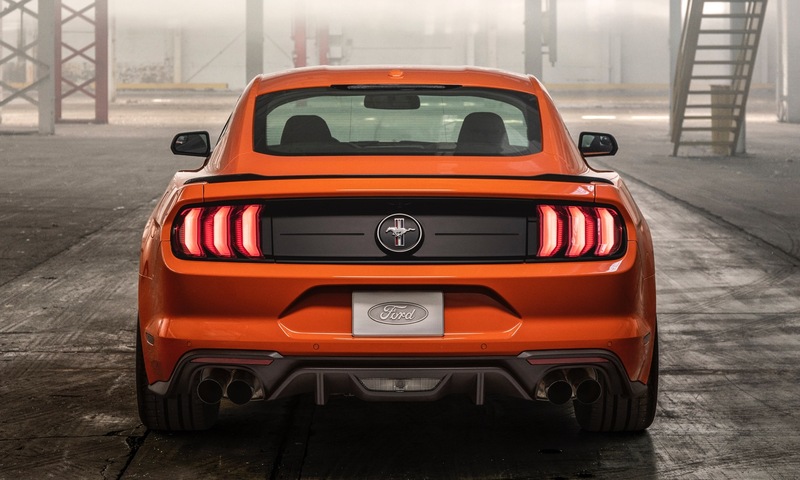 That’s because this new Mustang makes 330 horsepower and 350 pound-feet of torque from its 2.3-liter turbocharged four-cylinder – which is 55 horsepower more than the Turbo 1LE’s 275 horsepower 2.0-liter and 5 horsepower less than the V6 1LE. The V6 1LE also only makes 284 pound-feet of torque, it’s worth mentioning. Compared to the standard Mustang EcoBoost’s engine, this upgraded version (which is plucked from the Focus RS) gets high-performance cylinder heads, a five percent larger turbo, a larger radiator and more. It’s offered with either a six-speed manual or 10-speed automatic transmission and can hustle from 0-60 mph in the mid-four-second range. The package also includes the suspension and chassis upgrades from the 5.0-liter V8-powered Mustang GT Performance Package. That means you get an alloy strut tower brace, beefier front and rear sway bars, a retuned electronic power steering rack, and brake cooling ducts. Lightweight 19-inch aluminum wheels shod in 255/40R high-performance summer tires are also on the table, along with a black front splitter and a raised rear blade spoiler. Track day enthusiasts can also opt for the Handling Package, which includes upgraded brakes, MagneRide dampers, a Torsen 3.55:1 limited-slip differential, an even thicker rear sway bar and wider 19-inch wheels with 265/40R Pirelli P Zero Corsa4 tires. When we sampled the 2019 Camaro 1LE Turbo, we found the handling to be sharp and spry but were let down by the 2.0-liter turbocharged LTG engine, which, as we mentioned above makes just 275 horsepower and 295 pound-feet of torque in the car. The Mustang EcoBoost High Performance Package should be quite a bit quicker than the Chevy thanks to its more powerful engine, though we’d be curious to compare it with the slightly pricier Camaro 1LE V6. Ford’s also offering this package on the Mustang EcoBoost Convertible, whereas the Camaro 1LE Turbo and V6 are only available as coupes. The additional Handling Package will only be available on the hardtop, though. The Mustang EcoBoost High Performance Package will arrive at dealerships this fall as a 2020 model year vehicle. Once again, ford finds a way to spank chevy. Why can’t chevy make a formidable 4 cyl?? Because ford has been doing it for YEARS in Europe and the US. Get on it, GM, or lose the battle. Last respectable 4 cyl? Cosworth Vega, until??? Yes the 2.7l and we’re still waiting…..
All Ford can do is bump power. Pretty bad when a 6th gen Camaro V6 1LE is faster around a track than an S550 Mustang GT 5.0. Ford is way behind in IRS suspension tuning. Heck the 6th gen Camaro SS 1LE embarrassed the GT350 and its fancy flat plane crank oil burner. It’s going to take more than a power bump on the heatsoaked 2.3 EB to make up for the handling shortfall. Hopefully Ford remember to put the right headgasket in there this time. Oh and enough intercooler to make advertised power on less than 93 octane. You’re right that the Camaro handles better than the Mustang, but the Mustang wins on being a daily driver and the lower trims are better street performers. The LGX V6 needs to be wound out to get performance out of it. It’s got no balls on the low end, while Ford’s 2.3T just dominates at the low end. Ford even offers a tune package for it that adds nearly 100 hp and 80 lb-ft of torque – all with the factory warranty. Add in that you can see out of a Mustang and it has sexier styling, and you have Camaro sales in the gutter, with the 7th gen Camaro terminated by GM brass. It’s incredible how badly GM screwed up on the Camaro. They didn’t even offer obvious things like 1LE packages with automatic trannies, or MRC on V6 Camaros. GM developed MRC yet they fail to leverage it in anything but their most expensive products? Stupid, just flat out stupid. Do you realize that no performance enthusiast in the US, outside of ricers, wants a 4 cylinder? GM has had plenty of respectable 4-cylinders since then, but they never touted them as performance motors. Performance cars don’t get 4 cylinders. End of story. Times change, kind of glad to see that as competition always sparks improvement. That’s because they’re NOT performance motors while ford has always worked to get 4 cyl to perform. Bet you’ve never been in a ford with a 4 cyl turbo as you would know what I’m saying. Been in mustangs and even a thunderbird turbo coupe. That $hit will impress. It’s also why they’re favored in europe. Do I want a 4 cyl turbo? No, but why hasn’t chevy put the L83 5.3l in the Camaro??? Nahhh, they rather charge more for the 6.2l than give customers a choice with possible upgrade paths. With a simple cam change and tune and the L83 can outperform the stock LT1. Please don’t tell me the 5.3l costs as much as the 6.2l, it doesn’t and you can prove it in the truck configurator. A couple of reasons to buy a Camaro with a turbo 4 banger is because it’s many thousands below the cost of the V8 and the cost of insurance. One other point is that it’s very easy to remove the factory turbo and put on a better turbo to boost the power up another 15 to 20 percent. Run it on 105 octane propane and you gain another 8 to 12 percent in power. Actually, i might buy a used V6 Camaro and put a turbo on it. That might beat a 6.2 liter V8 and you have fun trying. Better handling too. And cheaper insurance than the SS V8. GM does have a higher power turbo 4 cylinder with higher boost sold in Brazil or somewhere else as an option, i forget where. It adds about 50 HP to the base turbo engine. GM can do the same with this North American market Camaro…..if they choose. The Camaro built for the Australian market is only a turbo 4 engine, no SS model V8 engines there. The turbo engines respond much better when a higher octane gas is used, for if you ran 105 octane propane in a 330 HP high output Mustang, you will gain another 10 to 12 percent in HP. Here in Canada, propane sells at the pump for about half the price of cheap 87 octane gasoline. Ford can drop in the 2.3-liter four-cylinder that churns out 350 horsepower and 350 lb-ft of torque from the Focus RS to outgun the base Chevrolet Camaro; but will the Mustang be capable of matching the performance and efficiency of a 3.6L DOHC-4V V6 in the Camaro. You are right about a turbo engine being better than the GM 3.6 liter V6. The huge amount of low end torque of a turbo engine overcomes high RPM power at a drag strip or everyday street driving. GM needs to use the turbo 2.7 liter 4 cylinder from the Silverado in a special version of the Camaro. God knows it’s no good in the Silverado, because it gets poor fuel mileage. I chose a 3.8 NA engine over the 2.0 turbo in the Genesis. The difference is night and day. The NA has way more pull and top end, at the dragstrip or street. I tend to agree somewhat about turboed engines and what you said. But it’s not always the case. I like where gm and Ford are headed in the future, finally catching up to what Japanese and Korean car companies have been doing forever. The Fast Lane Truck and Alex Jon Autos got 24 and 25 MPG highway with the Silverado 2.7T. Since when is that bad fuel economy. Want to know what bad fuel economy is? The 3.5 Ecoboost F150 still can’t beat the 6.2L 16-valve V8 in real world fuel economy, even when the 3.5 Ecoboost is moving a lighter truck. Now that I think of it, the Mustang GT’s 5.0 32V independent VVT and 10-speed barely matches the fuel economy of the Camaro SS’ massive 6.2L 16V pushrod V8. Ouch. Since a turbo engine will take better advantage of a higher octane fuel, than a non turbo, if you ran E85 fuel you will get at least another 1 to 2 MPG for the same driving, because of the much higher 95 octane. The torque is not much higher than the standard 4.3 liter V6 engine in the GM pickups, but the 2.7 turbo cannot be ordered for the base Work Truck model or even one level up from that. It ends up costing an extra $10,000 by moving up two trim levels and paying extra for the turbo engine. Just order the base WT model with the 5.3 liter V8, which will last longer than an overstressed turbo 4 cylinder. The V8 only costs an extra $1,800 over the base 4.3 liter V6 in the Work Truck. The 2.7L can be ordered in a wt. it is a $695 option in fleet trucks. Any one can order a fleet truck. There are no restrictions like the Caprice had. Why are people commenting Chevy is lacking behind? Need manufacturer makes a fast car, a few years later the other tops it. Been going on for years. Mustang was king in the 1980s, Camaro was king in the 1990s and 2000s, today it comes down to the driver with cars that are able to be matched up equally depending on the model you get. It’s amazing now that 4 cylinder factory tuned motors are running what I had in 1994 with my z28. GM tends to stick more to gas mileage in their 4 bangers with some exception. The Ecoboost is highly overrated in gas mileage Ford claims to get. My brother has a Ford Edge with the 2.7 turbo (I think?) And he gets bad mileage and his wife drives like a gramdmom. Basically it comes down to this, what one you want and like, because you can always match up a slower car to race and brag afterwards. Ford one week, GM the next week….don’t be disappointed in either manufacturer, because they make a fast car, and wait till it’s beat, then make it faster. The ecoboost Mustang’s performance is a bit underwhelming compared to the 2.0T Camaro considering the power ratings on it. If you look up reviews of the ecoboost Mustang and reviews of the 2.0T Camaro you will note that acceleration wise they are neck and neck. This is due to one simple thing, mass…. when Motor Trend compared the ecoboost Mustang to the 2.0T ATS the Mustang came in at 3,700 pounds and that is Camaro SS territory. That is hefty for a loaded ecoboost Mustang with 10 speed automatic, because of this it pulled a 0-100 time of 15.0 seconds compared to 14.4 seconds for the Cadillac ATS. If the alpha platform with the 2.0T engine with only 275BHP and 295lb-ft of torque was able to beat the 310BHP and 350lb-ft of torque ecoboost then does the Camaro really need a more powerful I-4 turbo engine?. So I always find it funny when people only look at the power levels and ignore performance while saying Chevy needs to win when they are already winning there. Huge fan of this generation of Camaro, but both the Turbo-4 & V6 need a boost in torque & HP. Maybe this performance challenge by Ford will leverage more performance for the Turbo-4 & V6. And, yes, there are significant advantages to the Camaro in terms of unparalleled Pony car handling, and a considerable weight advantage, but performance is trending to smaller more efficient engines while still maintaining traditional and expected levels of performance. We will sacrifice the aural excitement of the V8 sound, but we will be saving performance cars for the masses. How does the GM 3.6 need a bump in HP when it reaches above and In 1LE form can out down a better time then a 5.0 mustang? I don’t get it. GM Currently has the 2.7L L3B 310hp/348tq turbo, a 3.0L 404hp/400tq LGW engine and a 420hp/430tq 3.6L LF3 engine. What Chevy could honestly do is keep the LT & LS Camaro trims the same for the most part, keeping the 2.0T as the base engine for the Camaro, adding the 2.7L for the Camaro LT-1LE to give the car more power with it’s performance, Make the LS trim strictly the 335hp 3.6L V6 including the LS-1LE and above that, make a dedicated RS trim level that slots between the LS and the SS. The base RS V6 would receive the 404hp LGW engine with the non magnetic ride SS suspension, non brembo brakes, dual exhaust and a few other bits and pieces from the SS all with the regular LT/LS body work with a ground effects kit and a wickerbill spoiler, the RS-1LE would receive the 420hp 3.6L LF3 engine with the 10-speed Auto/6speed manual options, eLSD, Magnetic ride, SS-1LE Suspension and brakes, optional GMPP cold air intake and GMPP performance NPP exhaust w/ black tips (optional carbon fiber), ZL1 rockers, ZL1 rear diffuser, a taller rear lip spoiler, a black ZL1 style hood, unique 1LE front spoiler, unique 20″ wheel options (at least 2), optional RS/1LE graphics, red outline RS badging, red outline grille bowtie, black housing taillamps, Recaro seats, alcantara steering wheel, shift knob, shift boot, performance stereo system (not BOSE, something more like Rockford Fosgate or Alpine) w/ amplified speakers and subwoofers, optional sunroof, etc. What would also be nice is if GM expanded their performance line outside of the Camaro. A twin turbo V6 Colorado SS would be nice with a 2.7L Colorado RST slotting just below that as the street performance truck line. The same thing with the new Chevy Blazer and even the Chevy Malibu. Although I would see the Malibu getting the 335hp 3.6L N/A V6 in the RS and the 404hp 3.0L Twin turbo in the SS, both with AWD systems, Magnetic ride, performance exhaust and everything else they’d need for their individual packages. What would also be nice would be for GMPP to bring back stage package kits and performance upgrades for these cars. Also, the Duramax family of engines needs some GMPP love as well.